My husband was recently upset with me for not communicating with him about something that is extremely important. He called me and I quickly knew that he was displeased with me about something. Thankfully, when my husband gets upset about something, he usually does a good job about maintaining constructive communication to resolve the issue rather than ranting and raving or taking cheap shots on peripheral topics. When he explained the problem, I was clearly at fault. There was another issue this week where I had been responsible to take some notes and had made some mistakes in my note taking. 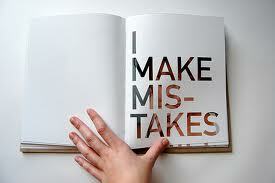 My gracious friends helped point out some of these mistakes and they were very kind and gentle with their help.